I recently conducted a survey of my social media "followers" or friends on Facebook and Twitter. 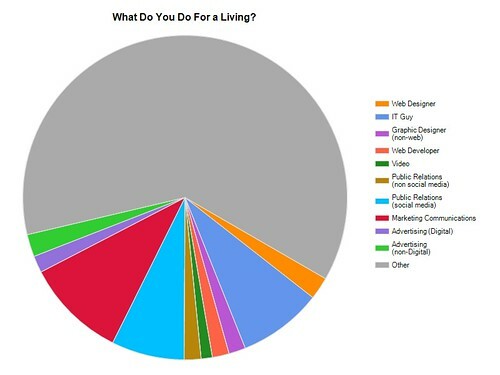 I opted to leave out Flickr, MySpace and LinkedIn for two reasons. 1) My greatest influence is on Twitter followed by Facebook. And 2) Many of my LinkedIn, MySpace or Flickr friends have "friended" or follow me on Facebook or Twitter. The survey was a spur of the moment thing. I had an "Ah ha" moment and went with it. I conducted a short, concise, unscientific survey with some random questions. I created the survey in under 10 minutes. Had I known that people would respond so positively, I would have put more time and thought into the questions. As expected, I did get a lot of -- Why are you doing this? But I also got a lot of Direct Messages that said, Wow! Great idea! And even more messages that said, Be sure to post your results. Which pleased me greatly. I think a lot of people knew exactly why I chose to do this survey. There were a few reasons. The biggest reason, I was simply curious. I have met many of my facebook & twitter friends in person but have not had the opportunity to learn more about them. I also love looking at statistics and insights (even if they are not scientific). The other reason behind my survey is business. I've mentioned that I am a "marketer," and though that has taken many shapes and forms over the past year, it is starting to become more focused. Knowing my "followers" helps me target various clients. It also helps me reach out on behalf of my clients to my network. I asked some general questions and some specific questions because of clients I represent. I also conducted the survey to dispel certain negative notions that people may have regarding social media. Non-believers think everyone is unemployed or unimportant otherwise they wouldn't waste their time. I think my survey will prove otherwise. I was surprised actually. I thought my "followers" and friends would make less money and be less diverse than they are. I was surprised at how many males responded and how young the respondents were and how old the respondents were. I guess, I assumed my followers and friends would be just like me, but they were all over the place. And in my opinion, that is a good thing! I was really surprised at how many responses I received in just a few short days. A total of 179 responses. I promoted the survey through Twitter (about 20 tweets over 3 or 4 days) and through Facebook. I posted it as a "status update" twice and sent an email to The Leyla Group on Facebook (feel free to join). I have about 1100 Facebook friends and almost 3000 Twitter "followers" so I was very pleased I received 179 responses! 55% of those who responded to the survey were male & 45% were female. Your job. This was tough because there are so many jobs out there! You will notice a vast majority selected "other" and here were a few of the most popular (and surprising) "other" answers in NO particular order: Mom, Sales, Real Estate, Healthcare/Medical, Music/Arts/Artist, Unemployed, Model, Chef, Small Biz/Entrepreneur, Law Enforcement, Service Industry, Recruiter, Disabled, Student, Finance, Hairstylist, Truck Driver, Magician. 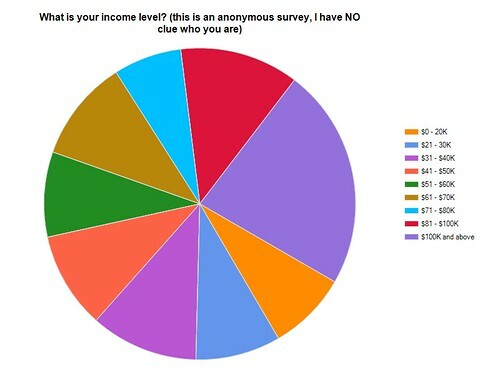 Your Income. I was also very surprised at how FEW people skipped this question. Only 7 people skipped it. I have no way of knowing how many people who took the survey were telling the truth - but why would they lie? It was anonymous. 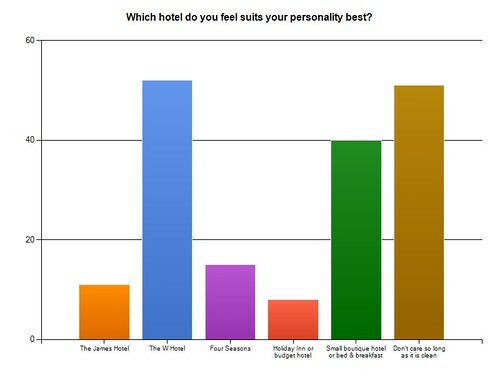 Which Hotel Suits You Best. This was more curiosity than anything else. I write a travel blog and I wanted to see what people's thoughts were regarding accommodation. Though I think where you elect to stay says a lot about you, if I were to do the survey again, I would re-think this question and likely ask it in a different way. Question for the Bloggers. 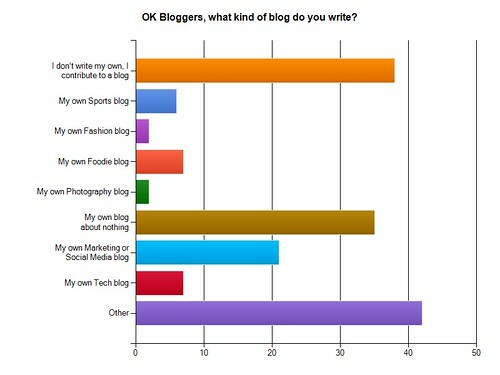 I asked what type of blog but didn't give the best category options! I excluded TRAVEL and I write a travel blog. Some of the "other" answers were: Travel, Business, None, Music and Personal. I thought that it was interesting that I had a "My Own" category as a selection yet SO MANY people checked "other" and wrote in Personal. I thought it was clear that "My own" and "personal" were the same - but clearly not. 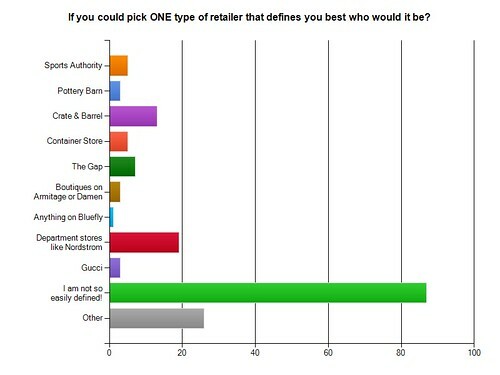 Retailer that defines you. My followers and friends are individuals, or at least they think they are individuals. That is an important thing for a marketer to know. A brand does not have to be original, it just has to make you feel original. Here were some of the "other" selections from the stores: REI (good one), Vintage, Hobby Lobby, Barney's (got a bunch of votes), Best Buy, and my personal favorite - Tractor Supply. 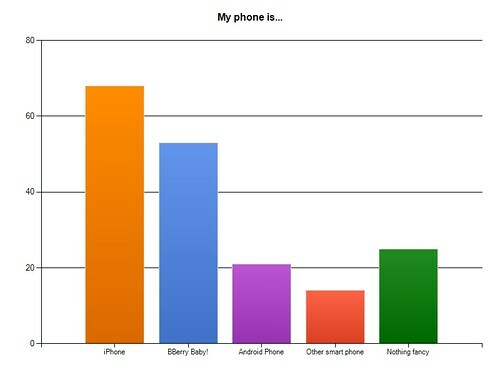 My people are smart phone savvy. But I already knew this. I would love to get your thoughts on my survey! Insults, compliments, constructive criticism....it is all welcomed in the COMMENTS. Please leave a comment below. I hate anonymous comments, but if you must, I understand. I publish all comments that are not blatant attempts at self promotion without any real commentary behind them. I'm going to guess that you were an adorably precocious youngster. Your survey and the posting of its results are very captivating. The anonymity feature made it attractive and the questions were easy and actually fun. I am a bit disheartened that I fall into an unpopular age bracket (well ok....it is unpopular to ME)but maybe that gives me a sort of cool status for an old.....oh you know. I vote for more surveys. The findings were interesting and I want to know more. Restaurants, foods, wines, places traveled, favorite form of travel, happiness with careers, how many careers have we had, children, pets....the list could go on and on, so I'll stop. Thank you for being whimsical. If you look at the age bracket - 43 and older is almost 20% that is way older than I suspected! To me, that is a good thing. It is probably also why the income was higher than I expected. I was really surprised at how YOUNG my followers were too. 17% are 26 or younger. It isn't easy to keep such a diverse audience. I'm like Oprah!